I'm very excited to announce that in a few weeks time i'll be having a fabulous new website with all the wells & whistles! I've recently received another lovely unsolicited testimonial, I really love my job! There's a short quiz for adults, plus a long quiz for both adults & children, plus lots of other useful information... it's only $1.99 or £1.49 so very reasonably priced too! Try it & let me know how you get on! Do you think you or a loved one has ADHD? A coworker? A student in your class? World renowned ADHD expert Dr. Edward M. Hallowell, child/adult psychiatrist, lecturer, past member of the Harvard Medical School faculty, and author of 18 books, brings you his easy to use application to help you determine if you or someone you love has ADHD. Dr. Hallowell helps you learn more about Attention Deficit Hyperactivity Disorder (ADHD) with two self-assessment quizzes and helpful ADHD background, next steps, resources, and news. Great for teachers and school counselors, too! Adults and children living with untreated ADHD have trouble focusing, remembering things, and completing tasks once they begin. Often, they don’t realize there is anything they can do; they think it’s just the way they are and will always be. If this sounds familiar; if your inability to concentrate is causing stress in your life; if your child has trouble completing tasks in school, score yourself with the two quizzes offered in this application. Only a qualified physician can diagnose you with ADHD, but the questions contained here may help you decide whether your issues are the result of normal life stress or a real medical condition. Check out this rendition of People are Strange by The Doors - (Neurodiverse People are Strange), It was created in dedication to Mary Colly, founder of DANDA & is intended to promote awareness of Neurodiversity. MindStyles that are given tags like ADHD, Aspergers, Autism, Dyslexia, Dyspraxia etc. Joseph Aquilina is a Singer Song Writer, Musician, Artist, Poet, Webdesigner, Dyslexia Specialist, Lecturer, Entrepeneur & campainer for awareness of neurodiversity as well as being ADHD & dyslexic. Forward this on to pass the Message. Some of my clients are using a great ADHD management tool & it's currently free to try! I'm registered as a coach with Skoach so clients can share their info with me so we can work together on scheduling & task planning. Skoach is so much more than a scheduler. As well as for keeping track of appointments, it's fantastic for planning & scheduling tasks. It has a "Task Tree" function whereby tasks can be broken down into manageable steps. It's a very visual format, with everything colour coded. There's a function whereby you create a colour coded "template" week which acts as the backdrop to the calendar function. I've been encouraging my clients to make similar templates for a while now so i was impressed to find that Skoach had this facility. It has a visual timeline which lets you gauge your progress, great for staying on task! It even keeps track of interrupted or unfinished tasks, puts them back in the task list & lets you record last/next action which helps you get back on track quickly. Skoach adapts well to many organising methods, including GTD, or goal based systems. It even sends you reminders by email (also by text if you live in the USA). You can even email Skoach to add to your task list/schedule. Anyway, a huge thumbs up from me! Let me know what do you think (add your comments below or email me!). Hope you like Skoach as much as I do! 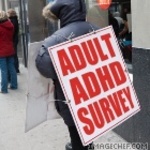 I'm undertaking a anonymous survey into the experiences of adults with ADHD. Services in the UK are so limited & it really is "pot luck" as to what help (if any) adults are offered. No names/email addresses/personal identifying data will be collected. The survey is now closed. The results are currently being analysed & will be posted here shortly. Thank you everyone who took part in the survey, there were 100 of you & your input is very much appreciated.